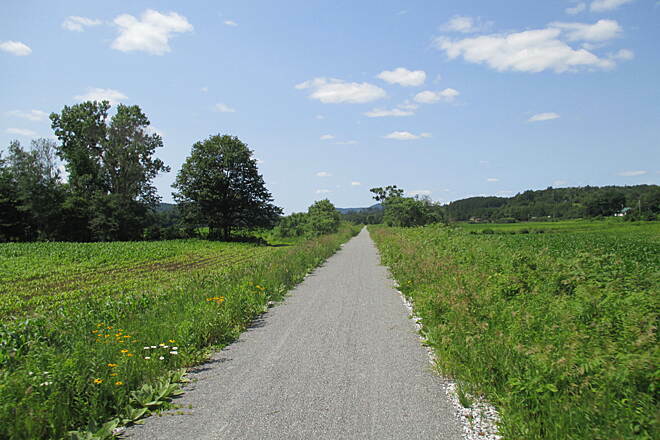 The Lamoille Valley Rail Trail (LVRT) is a growing, year-round trail across northern Vermont that will one day stretch 93 miles between St. Johnsbury and Swanton. 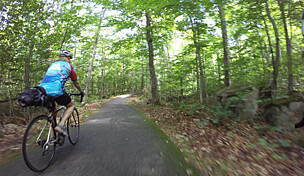 The trail passes through the spine of Vermont’s Green Mountain Range, from the Connecticut River to Lake Champlain. 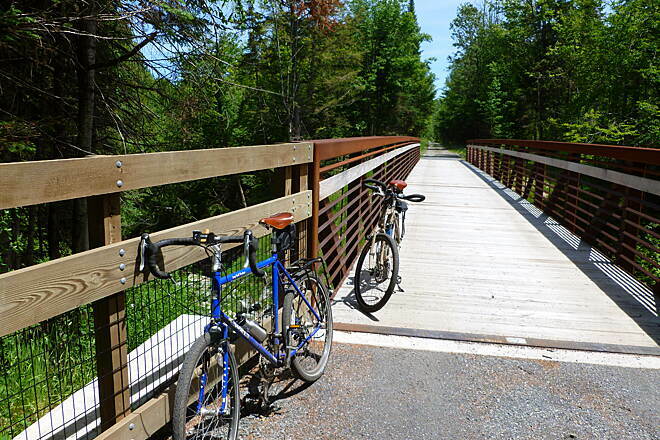 When finished, the LVRT, covering four counties and 18 towns, will be one of the longest rail-trails in New England. The LVRT’s grade never exceeds 3 percent, making it accessible to a variety of trail users and abilities. 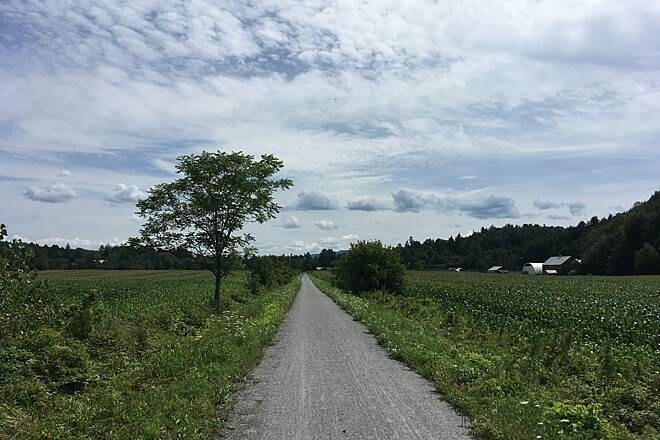 The developing trail is being built along the former route of the Lamoille Valley Railroad, which once served as a vital east–west transportation corridor from 1877 until its closing in 1994. The railroad was known as the covered bridge line and was a leaf peeper train for scenic tourism. 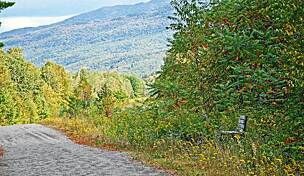 The Vermont Association of Snow Travelers has supported the project for many years and helps to maintain the trail. This section of the LVRT is loaded with a variety of scenic landscapes, including gorgeous wetlands and Joe’s Pond, a locally popular fishing, boating, and residential area. 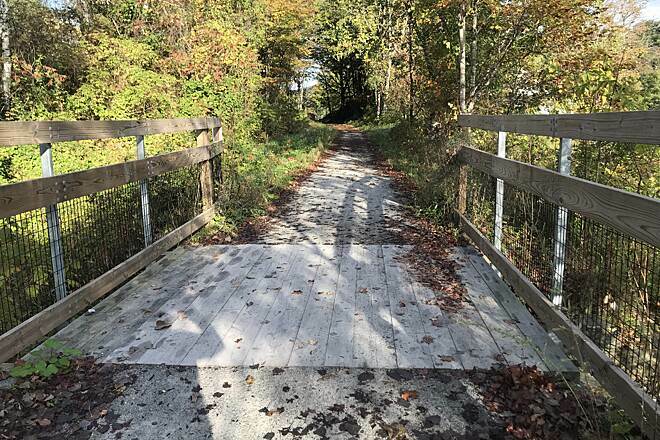 Trail users looking for an easier grade should plan to start in West Danville and head east toward St. Johnsbury. Beginning at Chanel Drive, you’ll head south along Joe’s Pond and then east, paralleling SR 15. Most of this section is flanked by trees, with a small residential area near the intersection of SR 15 and US 2. As you continue east and pass Danville, the trail snakes in and out of wooded areas and farm fields and crosses over a few local roads. You’ll encounter dramatic outcrops of bedrock—ledge cuts left over from the time of the railroad—as well as dense shaded forest and ferns in the warmer months. 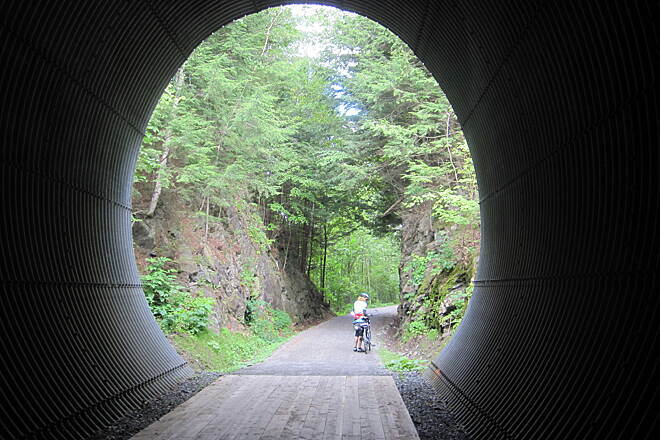 Closer to St. Johnsbury, tunnels help trail users avoid road crossings at US 5 and I-91 and also provide a cool spot in the warmer months. After heading under I-91 and reaching Mt. 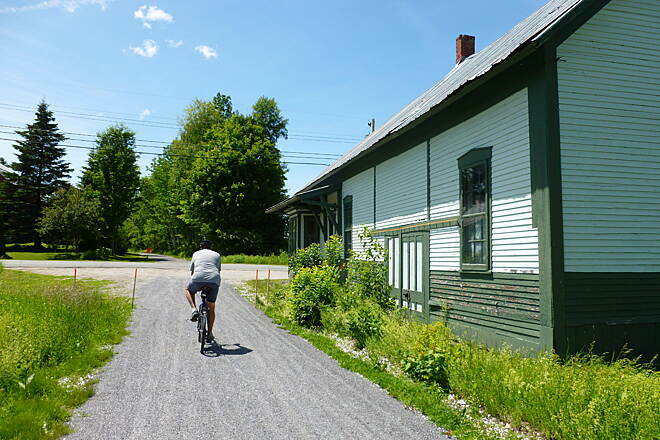 Vernon Street, you’ll enter the last 1.5-mile section of trail, also known as the Three Rivers Bike Path, which heads to the southern edge of St. Johnsbury, where you’ll find a small parking lot. This segment travels from Morrisville to Cambridge as it follows both SR 15 and the Lamoille River. 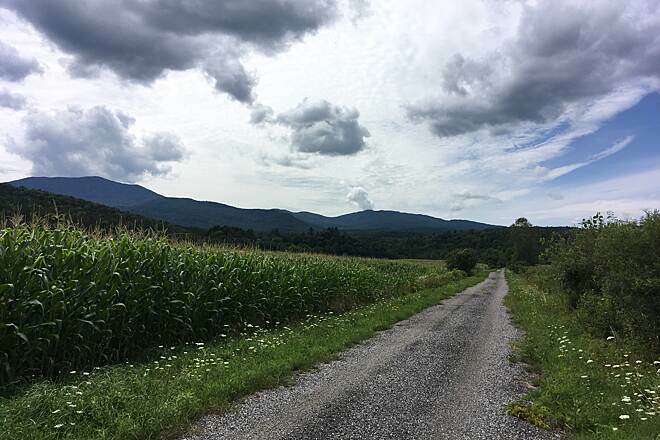 The quiet route passes through a wide range of landscapes—-from small towns to agricultural areas, meadows, and forests. Although the route technically begins at Park Street and Darling Road on the outskirts of Morrisville, the best place to begin your journey is the Portland Street trailhead, which has ample parking and restrooms. 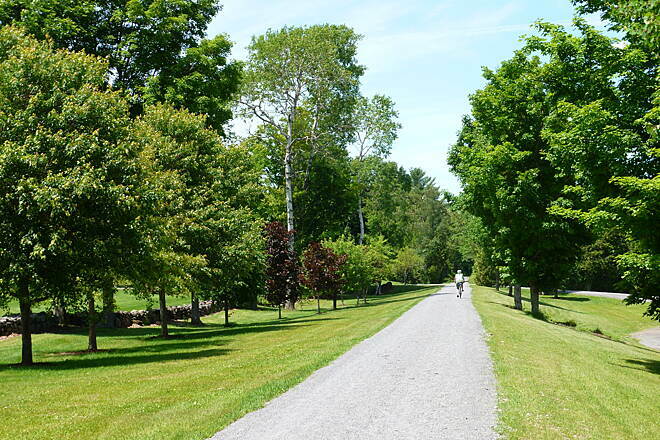 Heading northwest, you’ll skirt around the western side of Morrisville and through trees and farmland to Hyde Park. 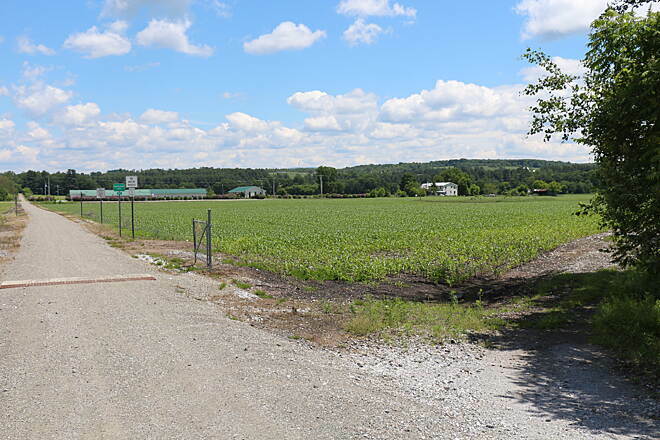 Passing a mostly residential area, you’ll continue through vast farmland and riverside areas and through Johnson. Here, The Old Mill Park is home to a trailhead with parking, restrooms, and water. 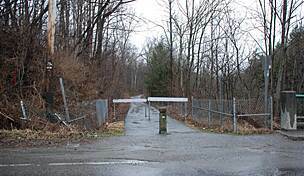 Continuing northwest past Ithiel Falls, you’ll eventually reach Cambridge Junction and Cambridge, where a seamless connection to the Cambridge Greenway takes you toward Jeffersonville. As you enter Cambridge, you’ll pass a restored train station that has been converted into a community playground with a train theme. 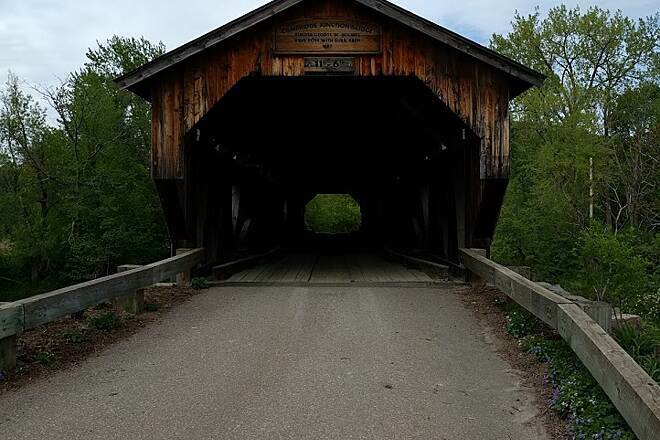 This junction (Cambridge Junction) is marked by one of Vermont’s iconic covered bridges, the Cambridge Junction Bridge (also known as the Poland Covered Bridge), built in 1887. Several small businesses, including cafés, ice cream shops, and breweries, have popped up throughout this section and cater to trail users. 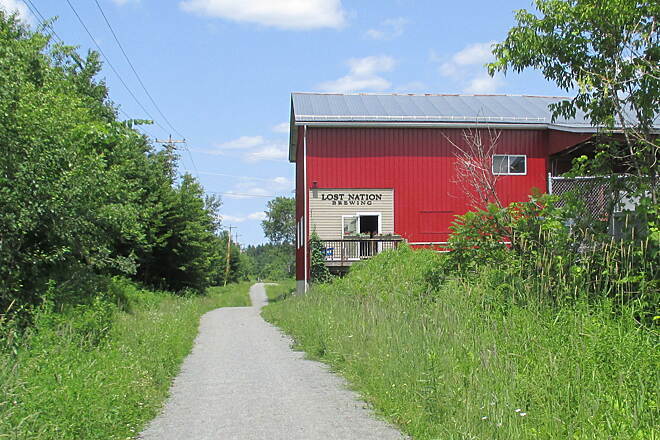 A small segment in Swanton stretches from Robin Hood Drive across the Missisquoi River to South River Street, offering neighborhood connections for locals. To reach the endpoint in West Danville from I-89, take Exit 8 toward US 2/SR 12/Montpelier/St. Johnsbury. Merge onto Memorial Dr., and go 1.7 miles. Take a slight left onto River St., and go 1.2 miles. At the traffic circle, take the second exit onto US 2 E/E. Montpelier Road/River St., and go 24.4 miles. Turn left onto SR 15 W, and go 2.2 miles. Turn left onto Channel Dr. Look for the small parking area to your right in 0.5 mile. 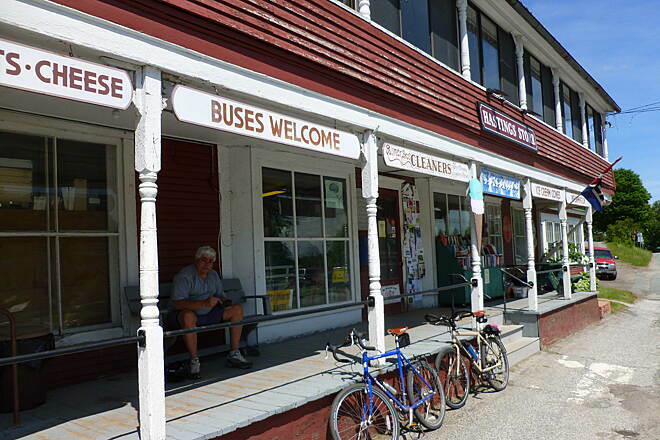 To reach the St. Johnsbury trailhead from I-91, take Exit 20 for US 5 toward St. Johnsbury. If you’re coming from I-91 N, turn right from the exit onto US 5 N. If you’re coming from I-91 S, turn left off the exit onto US 5 N. Go 0.4 mile, and turn right onto Main St. Make an immediate right into the small parking lot and trailhead. 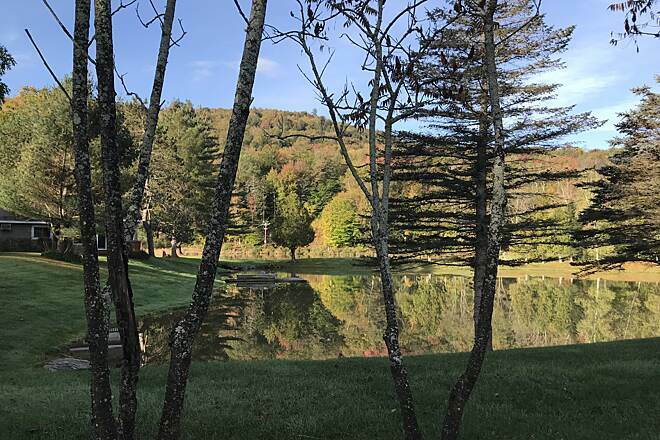 To reach the Morrisville trailhead from I-89, take Exit 10 for SR 100 N toward Stowe. Head northeast on SR 100 N, and go 18.2 miles. Turn right onto Bridge St., and go 0.3 mile. Turn left onto Portland St., and go 0.1 mile into the parking lot. 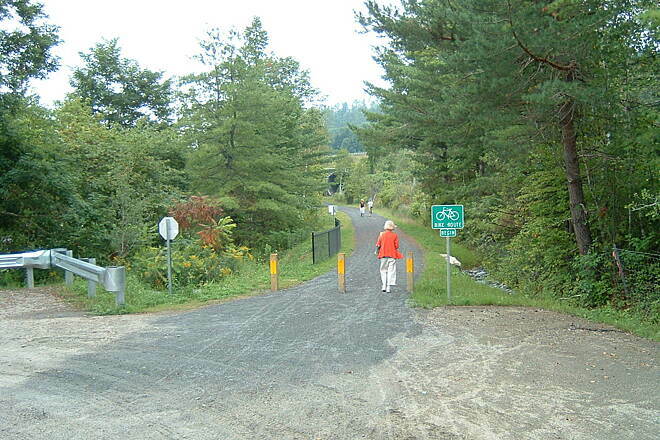 The Swanton Segment of the trail has no dedicated parking lots. My wife and I went from St. J to West Danville and back, using most of a somewhat cool late June afternoon/early evening to do so. For nature, the many bedrock cuts are now beautiful niches, typically with an abundance of ferns. The wetlands, however, at the West Danville terminal were the highlight of the trip. Look for the "swamp camp". A reviewer expressed concern about maintenance. I am happy to report the vegetation neatly trimmed on the sides with no grass encroachment on the trail. The gravel surface is in excellent shape. 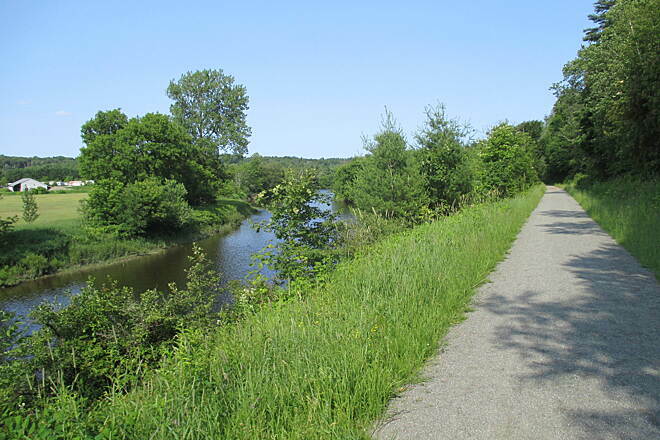 The views are good for a rail trail, with a rather large opening to the south in Danville. Missing a star due to the somewhat scary route 2 crossings and the somewhat scarce latrines or formal rest/picnic areas. Only 2 are marked on the official map available at lvrt.org. A gentle but consistent railroad grade makes for good exercise on the outbound trip, and easy downhill on the way back. Excellent surfacing and trail maintenance. Shaded enough to do at noon on a hot day, but with open stretches where more things can be seen besides trailside flora. Beautiful 19th c. deep rock cuts and 21st c. tunnels under highways are like going into air conditioning! 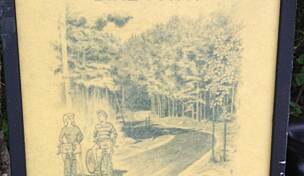 I rode Cambridge Jct to Hyde Park & return one day, then Morrisville to Hyde Park another. The parking area in Cambridge Jct is very nice. There's a nice shelter with portapotty and even a train theme picnic area adjacent. Smuggler's Notch Ski Area has done a lot to improve this spot this summer (carpenters were working on the train the day I was there). The trail from there to Johnson is pretty much level, with a few small/short grades, the trail is crushed granite hard-pack. 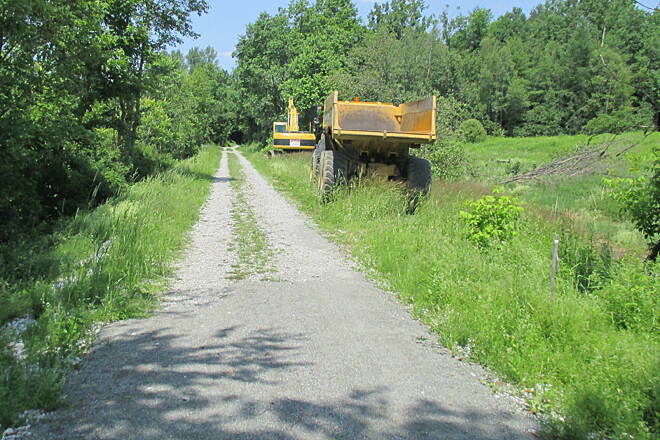 The town road crews maintain the trails in their municipality, and some cut the brush more often. Sometimes the grass & weeds will whack your shins as you ride, but the tree limbs had been kept off the trail. 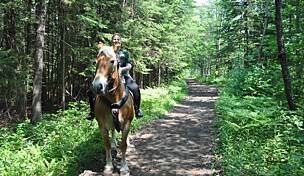 You ride along the river, through fields of fodder and forested areas. Johnson has a beautiful kiosk with water and a portapotty, and downtown is just a half mile away, down Depot St. From there to Hyde Park is more fields, forests, river and a beautiful through truss bridge. Hyde Park to Morrisville is mainly uphill. If you go east to west it's a leisurely ride. This section is mainly wooded, with high fills down to the river in places. The Lamoille River is always nearby. 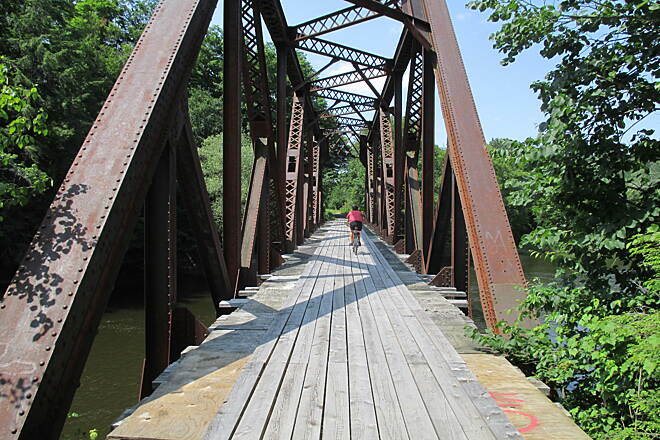 You also cross quite a few roads, and the through truss bridge in Morrisville. 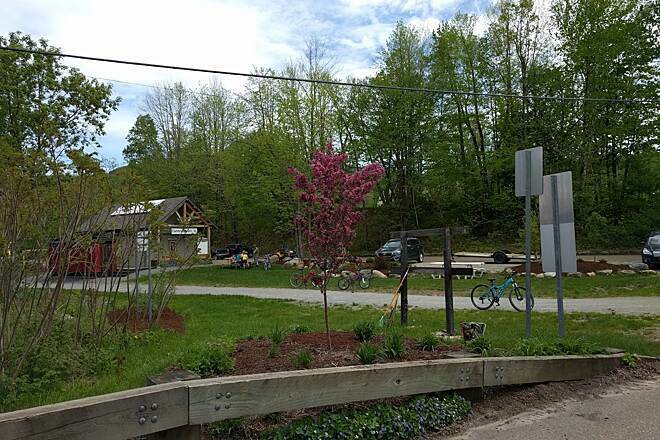 Just west of Morrisville village you pass right behind the Lost Nation brewery, and many trail users stop to sample their creations. The depot in Morrisville is a restaurant as well. And about 1/4 mile south of the depot is a bike shop if you need any supplies. Parking in Morrisville is adjacent to the depot. I went a short distance east of Morrisville, even down the unimproved section. Not sure how far you can go, but I do know there are a couple of bridges removed. The trail is railroad ballast, with tall grass/weeds. We did this ride on a beautiful sunny Saturday in August, and saw almost no one on the trail. It is mostly shaded, which was welcome on a warm sunny day. Not much in the way of views, but very nice anyway. There is a mild but steady uphill grade almost all of the way from St. J to Danville, so you have to work a little, but that makes the ride back very pleasant...and much quicker. A great addition to the Northeast Kingdom. My wife and I ventured on this trail the 4th. of July weekend 2016.We were somewhat disappointed in the following on this trail since there was a lot of good said in the media during the recent opening of this stretch. 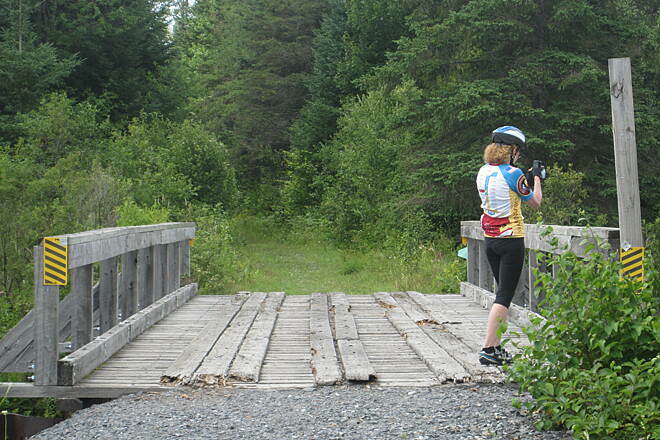 We are experienced trail riders and started in Morrisville towards Cambridge Junction. Approx.16 miles in either direction. The surface was great and rideable along with a lot of scenic river and mountain views. Unfurtunatly there were no benches to pull over and rest on the entire trail section. 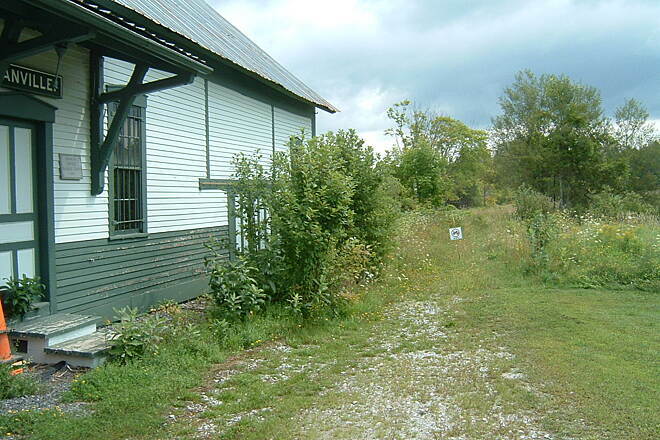 It also bypasses the Town of Johnson completely without signage. Some of the local merchants could benefit greatly with selling some cold drinks, a sandwich or even a creamee to the trail rider. The only stop with that one can make is on the Morrisville side at the Lost Nation Brewing Co. which is next to the trail. Certain sections need the side of the trail mowed of unruly weeds that have taken over the trail already in a short period of time.The weeds are so overgrown that the travel lane is down to one narrow path stopping oncoming riders. This trail can be a great one with a little brushhog maintenance and some benches and signage. 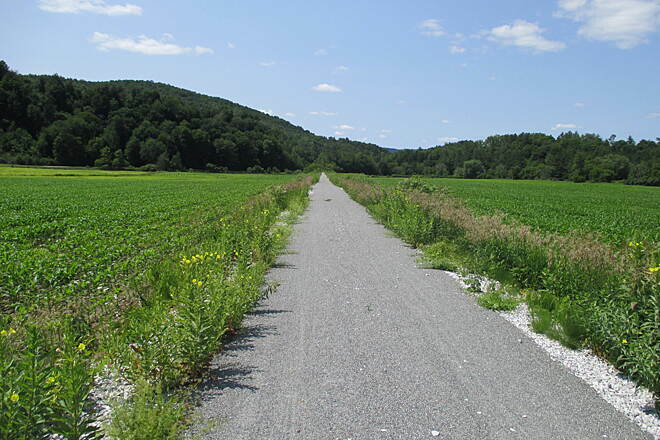 The Lamoille Valley Rail Trail (LVRT) will someday stretch 93 miles across northern Vermont. 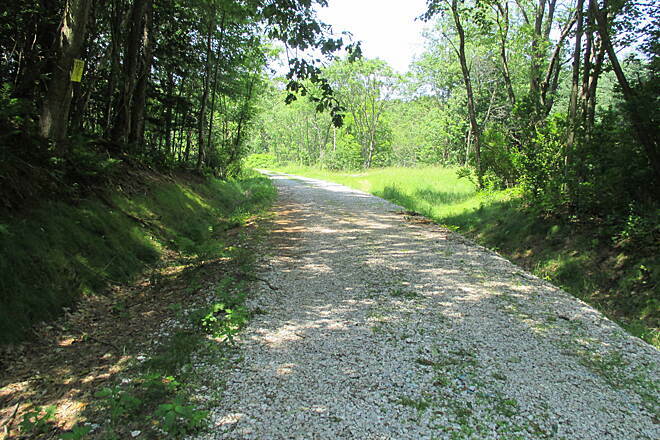 Currently there is about 35 miles of nicely built hard-pack rail trail in 3 different sections. 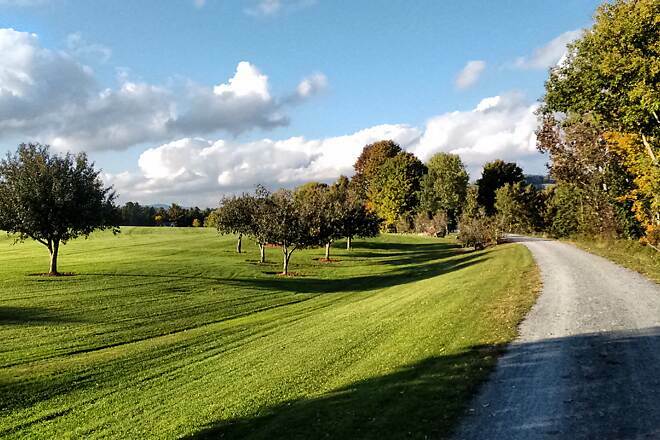 In 2015 I reviewed the St Johnsbury to West Danville section. 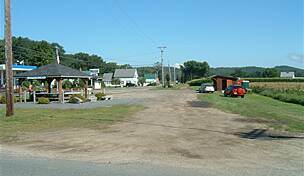 But today Sue and I rode the newly opened section which begins at State Route 15A in Morrisville, passing through downtown Morrisville, skirting downtown Johnson on it's way to Cambridge Junction and Cambridge Greenway. Once again, the trail is all new and sports a very nice hard-pack surface, even road bikes (with the exception of the super-narrow tires) would be fine on 99% of this trail. 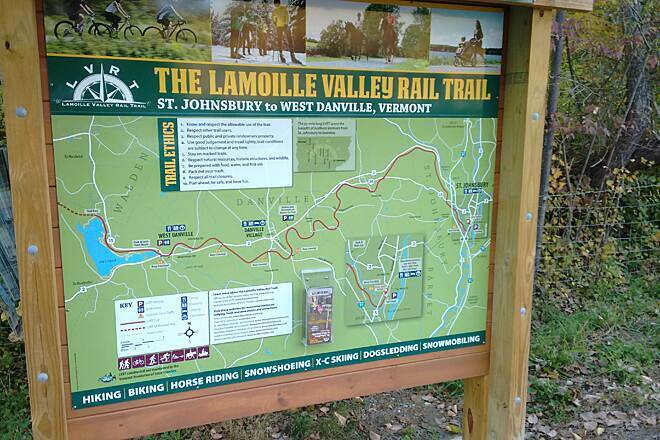 This trail section also features some really nice views of the Lamoille River, farmlands and mountains. (The aforementioned St Johnsbury to West Danville section tends to be more wooded, this Morrisville to Cambridge is much more open). 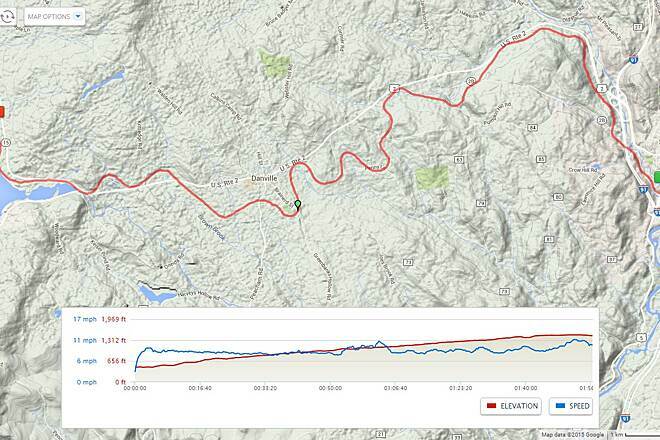 The trail section has an overall downhill grade from Morrisville to Cambridge, but the elevation change between the two end points is only about 275 feet or so over 18 miles. The towns of Morrisville and Johnson offer several food/shopping options. The town of Johnson is about 1/2 mile off-trail (access road from Johnson is Railroad Street). The LVRT organization has done a great job on this trail so far. Even though the completion of the 93 miles are years away, what they have done so far is very nice and this is a very enjoyable ride/walk for all ages. 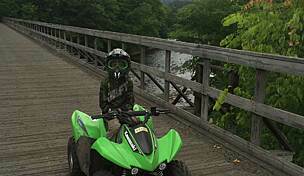 My wife and I rode this trail in August from St Johnsbury to Joe's Pond. Riding the trail in this direction is all up hill for the 17 miles with one or two short level or down hill sections. That made the return trip very easy. Trail is in excellent condition with most of it in wooded or shaded areas. We'll consider riding it again next year when we're back in New England. My wife and I rode the trail in August. We didn't know the grade at the time, but we're glad we started in St Johnsbury and did the up hill direction first. The grade is the only negative. Trail surface was good and the scenery nice. Didn't see many people but we were on the trail in the middle of the week. We'll likely to do it again when we're back in the area next summer. Joe's Pond makes for a nice stop/turn around point. 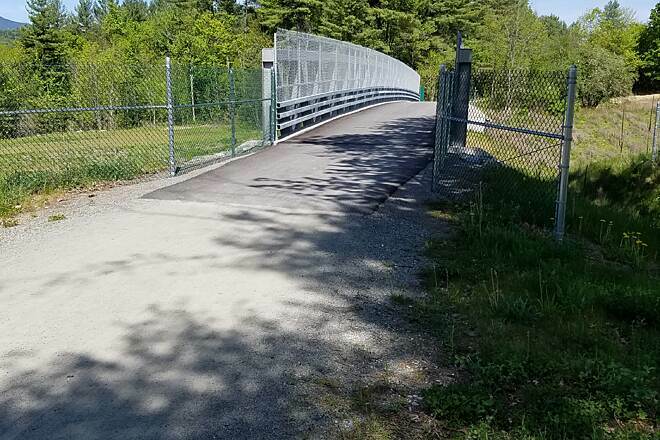 The trail is now open from St. Johnsbury to the north end of Joe's Pond in Danville. 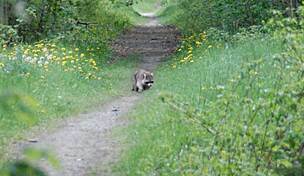 - The trail is not too busy, although I suspect it will become more popular as word gets out. - The bridges, signage, and other infrastructure are all great. - Scenery is wooded. No breathtaking views, but no bad views. - Grass is coming up here and there. I am concerned at how the trail will look as time goes on. - The entire run from St. Johnsbury to Joe's Pond is uphill. There are NO breaks! While it's just a railroad grade, I am surprised that nobody has given any sort of warning about this. I saw some people struggling. 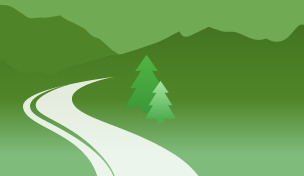 The bottom line is that this is a great start, but I think that the trail will appeal to a lot more people if they can build the next phase so that there will be more trail available that is level. I've been dreaming about this trail for years now. Finally a major section is ready to ride. 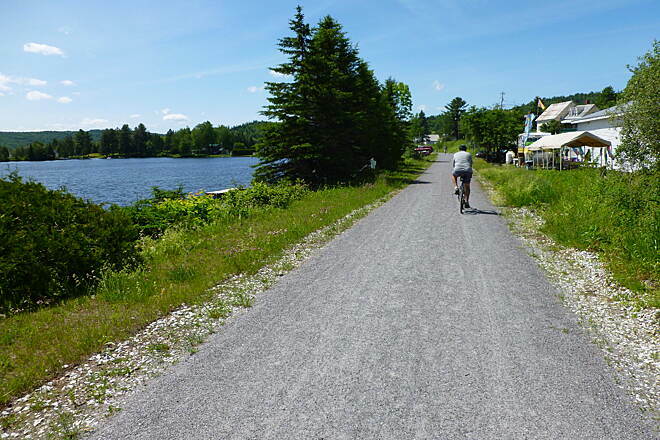 I rode this from the eastern trail head in Saint Johnsbury to the northwest end of Joe's Pond, where it turns to ballast. The trail itself is in very nice shape, smooth and wide. The culvert (tunnel) under US 5 is lit, with motion sensor lighting. This would be a good idea under I 89 as well. The views are mostly woods until you ascend he hill that separates the beginning and the end. The sounds of US 2 drift in through the trees occasionally, but it is a fairly quiet trail. In Danville, the land opens up a bit, with some nice views to the east. The end of the trail at Joe's Pond, surrounded by wetlands north of the pond, is a perfect place to rest and observe wildlife. Prime area for herons. I saw a Kingfisher. There are a few at grade crossings, three of which cross US 2, which can be busy. For a rail trail, there is a lot of climbing. 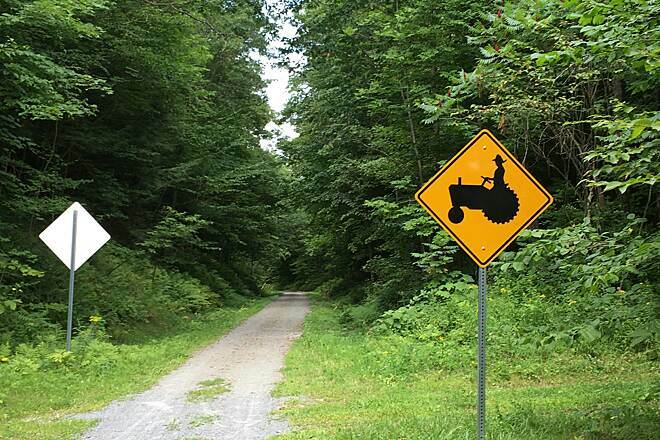 Reminded me of the Great Allegheny Passage west of Cumberland MD. From around mile 2 to mile 7, it is not steep, but a steady climb. My topo maps tell me I climbed over 1000 feet. It's a great trail. Can't wait until it's finished. Thanks to the Vermont Association of Snow Travelers for getting this done. More, please. 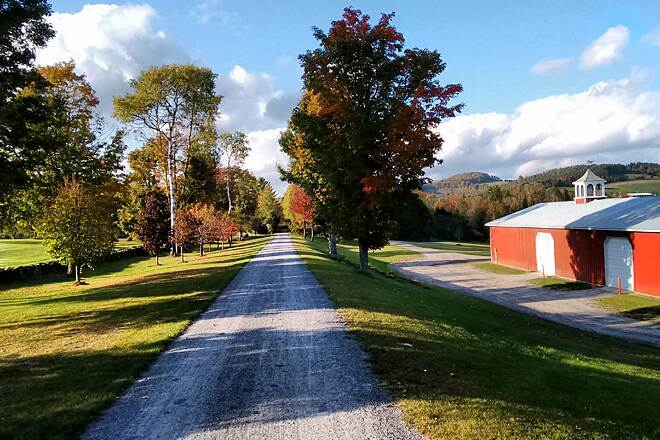 St Johnsbury to Danville: Wonderful Ride! even though the LVRT is not officially open, I suspect it will be official within the next week or so (today is 8/27/2015). I just did the whole 16.2 mile trail from St J to the end of the completed trail past West Danville's Joe pond out and back for a great 32+ mile ride.the trail is in great shape, all the signs are up, even the brand new brochures are available in both St J & Danville. when I returned back to the St Johnsbury trailhead at about 5pm, the parking lot was totally full! and people were on every mile of the trail. I'm guessing Labor Day weekend will make it official (just guessing). other than a couple of railings on some very short culvert crossings, and maybe some painted crosswalks where the trail crossed a road, is looking great and riding great! 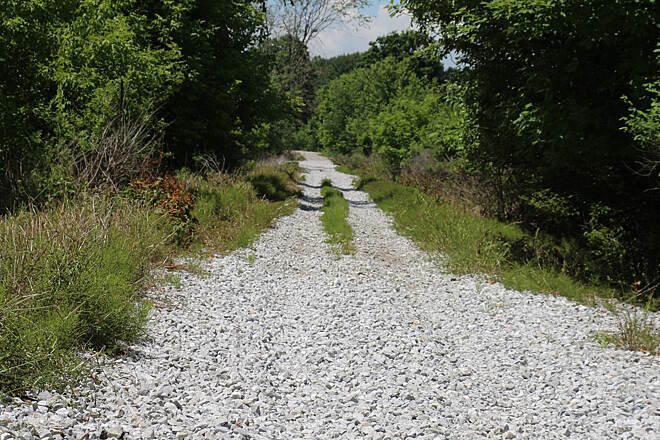 according to mapmyride app, there is an elevation gain of 1,000 feet from St J to West Danville.once traillink allows reviews on the web based page, I'll post a longer review, they only allow reviews on the mobile site for "project" trail trails, cmon traillink, this is an active trail! excited to have a new trail in the works! First things first. The LVRT is officially not open. Parts of it do exist and are wonderful to ride if you are lucky enough to figure out where to access them.